THIS KIT WAS DESIGNED FOR THOSE SMALL TO MEDIUM AREAS WHERE A LARGER BUFF JUST CAN’T REACH. JUST SNAP IN YOUR DRILL AND YOU ARE READY TO GO. 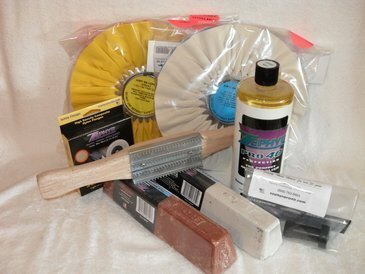 THE KIT INCLUDES A 4″ SHANK MOUNTED BUFFING WHEEL (SHANK CAN EASILY BE REMOVED FOR USE IN A SANDER/GRINDER), 3″ SCUFFING PAD FOR RUST AND PAINT REMOVAL, 2″ TAPERED POLISHING BUFF, 1″ X 2″ FELT CYLINDER, 1 MICROFIBER TOWEL 16″ X 16″, AND AN 8 OZ. BTL. OF PRO 40 METAL POLISH.